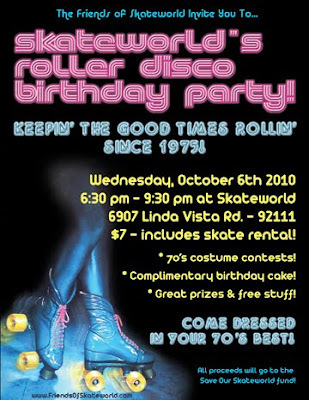 October 6th - It's a Roller Disco Birthday Party for Skateworld! The Friends of Skateworld are hosting a birthday party for Skateworld! On Wednesday, October 6th, Skateworld will be celebrating 35 years of rollin' good times in San Diego with a Roller Disco Birthday Party! Please mark your calendars and invite your friends! This is sure to be a fantastically fun event complete with costume contests and birthday cake! Get your best 70's outfits ready! Admission is $7 and includes skate rental! With your paid admission you will receive a ticket for an opportunity drawing and could win a great prize - like a pair of skates! You won't want to miss this party! Be sure to visit www.SanDiegoSkateworld.com for their latest skate session schedule. They are OPEN for weekly sessions and available for birthday parties and special events. We'll see you out on the floor! Skate & Eat - and Help Save San Diego's Last Roller Rink! Did you know that San Diego has only ONE roller rink in the entire city? Skateworld has been keepin' the good times rollin' since 1975 and now they are in danger of being forced to close their rink in Linda Vista. We can't let that happen. 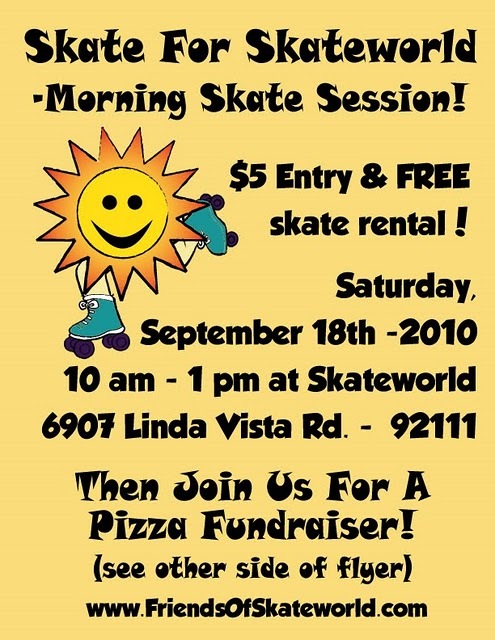 The Friends of Skateworld (FOSW) is a nonprofit group that is working diligently to see that San Diego keeps this rink. Please visit their website and read about what has been going on with the city council. The FOSW is also organizing some fun fundraising events to help get the public involved. ALL proceeds from these events goes to the fund to help save Skateworld! Don't forget to sign the online petition and send letters of support to the city council! Skate For Skateworld - Saturday Morning Skate! 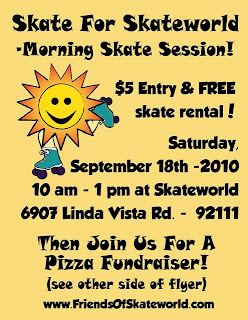 Skateworld - 6907 Linda Vista Rd. The FOSW is hosting a special Saturday Morning skate session at Skateworld! Have your morning coffee and then grab your skates and get out on the floor! Admission is $5 and skate rental is FREE! All ages are welcome, so bring the family! What a great way to start your weekend! Eat For Skateworld - Pizza Fundraiser! Do you like pizza? 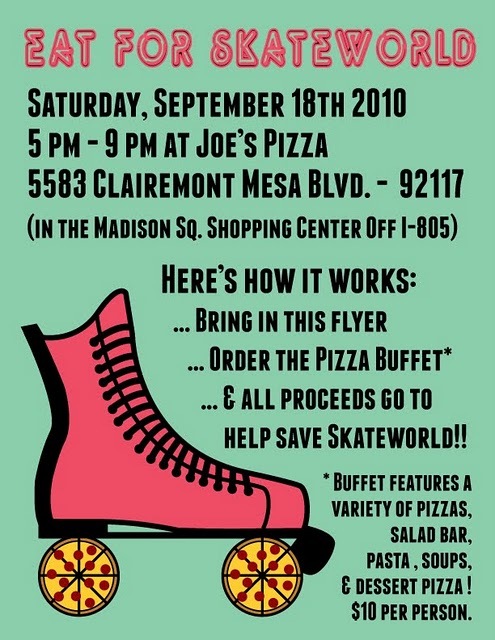 The Friends of Skateworld invite you to a Pizza Fundraiser at Joe's Pizza! 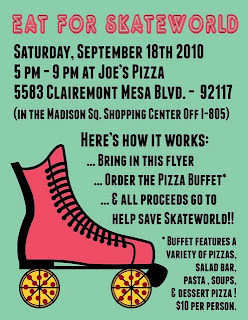 Here's how it works; come to Joe's Pizza on Sat., Sept. 18th between 5 pm and 9 pm, order the pizza buffet and let them know that you are there to support Skateworld. All the proceeds will go to help save the rink! It's simple - and tasty! Joe's pizza buffet features a variety of pizzas, salad bar, bread, pasta, soups, and dessert pizza! All for $10 per person! They also serve beer & mojitos! Get a Taste of University Heights This Sunday! What is the University Heights Arts Open & the Taste of UH? This is a collaborative event with the University Heights Community Development Corp. and Taste of University Heights. So, get ready for lots of fun, food, and art! It all happens on Sunday, September 12, 2010, from noon to 5 p.m. So, what will be waiting for you in University Heights? Stroll through the quaint neighborhood while enjoying sample delicacies from some of University Heights diverse restaurants. Then, enjoy a free self guided tour of the arts. The UH Arts Open showcases the works of over 100 new as well as celebrated artists, playwrights, performers and musicians from the San Diego region enlivening the historic University Heights community. The UHAO incorporates local businesses, schools, churches, theaters, and a free shuttle tour of artist studios in the area. This year marks the 100th anniversary of the Teachers Annex Building located at the intersection of Park Blvd. and El Cajon Blvd. The grassy open area will serve as the Artwalk area, featuring visual artists of all mediums, as well as historic groups, community groups, the taste ticket will call, free parking and shuttle start. Be sure to stop by the North Park Craft Mafia booth! Members Meagan Rae Designs, Artista Muerta, and Velvet Klaw will all be there to represent! Live music, performances, and theater will be featured across the street at Swedenborg Hall. Get more info online at www.UHarts.org. Catch a free shuttle that will take you on your Taste and artist studio tour throughout the day. The UH Arts Open is FREE, but you will need a ticket for the "Taste". They are $15 in advance or $20 the day of event. This includes entry to raffles with prizes! "Get In Gear" With Derby Lite: San Diego! Thinking that derby skating might be for you? Come to the Get In Gear event and give it a try! Watch a demo by current members & strap some skates on and give it a go! Skates & gear are provided so you can try before you buy. The event is FREE and open to all ladies 18 and over! Crafty Conspiracy Craft Night - 4th Tuesday Every Month! New Location in Escondido! Mafia members have appeared on the SD Living show on CW 6 where they have presented some crafty projects for viewers to try at home! If you miss a segment just visit us on YouTube! Velvet Klaw is a Founding Member of the SDNPCM!